For nearly three decades Grant Caldwell has been writing some of the more interesting and fearless poetry in Australia. A relentless observer of the absurd and odd, Caldwell’s predominant tone has been a wryness capable of quiet awe. His poetry is pulled taut between these points. The lines are clipped and his narratives drift to punch-lines that rarely miss. At times he seems to reiterate Berryman’s quip that, “Life, friends, is boring”, but also that poetry and resilience are often located in the strangest, most overlooked places. It makes for uneasiness, this knowing that we don’t know everything that’s out there in the dark and at the edges. More hyper-alert than paranoid, the speaker of these poems has questions with no answers, only suggestions and second-guesses. One can’t relax within these poems, or rather, one can relax so long as one is happy to be challenged, to rethink our basest assumptions about selfhood. 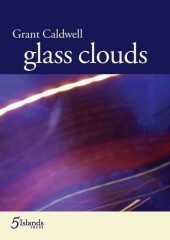 Glass clouds is attentive to the illusive sublime in the senses’ peripheries, and this abstraction is strangely tactile in the title poem and many others, such as ‘a short history of the future’ and ‘the sky in your brain now’. Perhaps the sky in one’s brain is a potential short history of the future. There is more than one reference to the sky in the mind, and when the poet confronts us with the limitations of thought, symbols and assumptions, the reader is made alert to the gulf between the stultified self and the potential, spaceless human experience. A self-confessed adverb killer, with a knack for brevity, Caldwell might find that statement overblown. Suffice to say his semiotic excursions appear authentic. There is tenderness here, what Caldwell elsewhere calls “a test of your detachment”. Like much good haiku, there is an awareness of impermanence and the unexpected. The understated nature of these small poems is to be noted, yet some seem a tad flat or unoriginal. They work best when Caldwell brings his own voice to the form. This time the phantom presence is an echo, prompting musings on the timeworn, irresolvable themes of life and death. We’re asked “did we not hear it just then”, and warned “so be careful what you think”. Humour is used more sparingly here than in his previous collections. ‘Free bison with the net up’ is a piece of comic reportage about a herd of loose bison eventually cornered on a Baltimore tennis court, with an ending more macabre than comic. ‘Unhappy’, a poetic romantic comedy about a man and a woman, is also funny and unsettling, but with a happier ending. Timing is everything in these poems, there are few if any wasted lines, and the reader can expect authentic flow to pull them through. A clear standout is the long poem, ‘two black chairs’. It is irreverent, funny, sad and full of pathos for its characters and the inanimate objects around them, for “a picture of Elvis before his dissipation”, for “a white rose and a black purse”, for “two black chairs”. Repetition and rhythm are used to fine effect as we sway in the shadings of the real and the invented. ‘Asylum’ is the one overtly political poem, and is made stark by that fact. Its conversational tone and matter-of-factness are reminiscent of Hayden Carruth’s ‘On Being Asked To Write A Poem Against The War In Vietnam’. In 22 lines, ‘Asylum’ is a technically inventive encapsulation of the history of white Australia, while remaining personal and alive to the difficulties of writing political poetry. To quote from this poem, and indeed from the book, is to do it an injustice. To not quote more of it also seems a disservice. It is to be recommended for its descriptions of Melbourne weather, and the exponential swell of many of the poems lifts a threatening meniscus of meditative experience. They contain a lot, but the spill is minimal. There is both range and cohesiveness, which is admirable given that the book spans seven years work. Glass clouds is almost devoid of punctuation, as if to suggest that commas, full stops, and especially question-marks litter so much of daily life that their presence on the page is often obsolete. It works in favour of ambiguity and multiple truths, and perhaps this is Caldwell’s real strength. He avoids resolution, while at the same time — to paraphrase Ferlinghetti — he’s not so open-minded that his brains fall out. As an aside, albeit an important one, Caldwell’s publishers are to be praised for the high quality of the book design, an encouraging trend in local presses. This entry was posted in BOOK REVIEWS and tagged Grant Caldwell, Nicholas Powell. Bookmark the permalink.